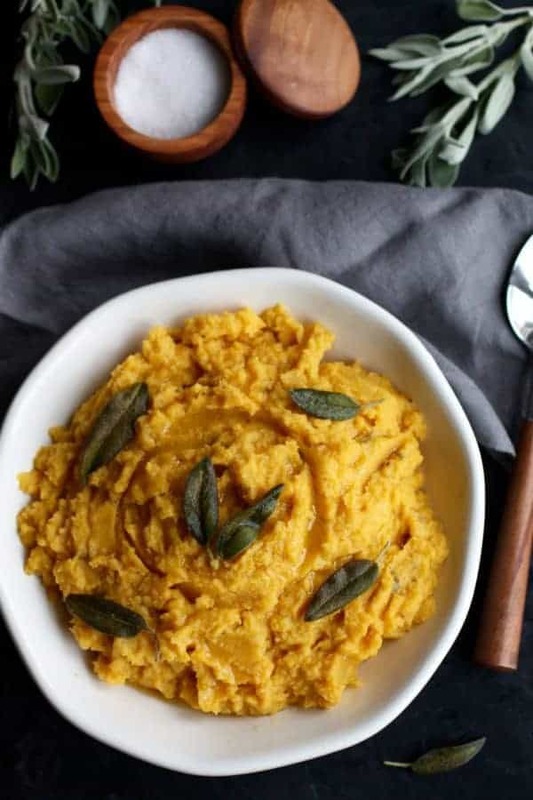 Cauliflower Butternut Squash Mash with Sage is a creamy, buttery side dish that’s full of flavor and packed with nutrients. A perfect addition to your Holiday menu and a recipe that was inspired by the Whole Foods hot bar! This isn’t the first recipe that was inspired by the Whole Foods hot bar and it probably won’t be the last. Just recently someone asked us how we come up with recipes and if we ever run out of ideas? Most of the recipes we create our through our own experimentation, your requests and sometimes a concoction of the ingredients we have on hand. 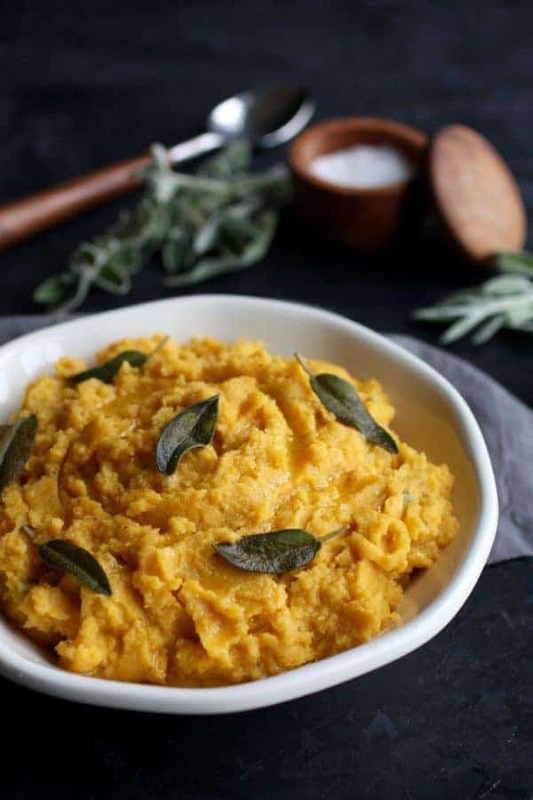 Then there are those recipes that are inspired by dining out and in the case of our Cauliflower Butternut Squash Mash with Sage recipe, the Whole Foods hot bar. And no, we never run out of ideas! Made with just 6 ingredients. The scrumptious side dish that Jess and I discovered on the Whole Foods hot bar consisted of potatoes, butternut squash, sage and was made creamy with milk. When we took our first bite, we knew it was a recipe we had to recreate with our own twist. For simplicity and for this dish to be Whole30, vegan, paleo and allergy-friendly I made a few changes to what was listed as the ingredients on the Whole Foods hot bar. To make it dairy-free, I omitted the milk and added a little broth plus Pure Indian Foods ghee which gives this dish a nice, buttery flavor (sub coconut oil for vegan) and creamy consistency, and to make it a little lighter I substituted the potatoes for cauliflower. Cauliflower mash isn’t something I normally go for as it often results in a watery, tasteless, odd textured slop. I dunno…maybe I just need to work on my cauliflower mash making skills or maybe that’s just how it is. 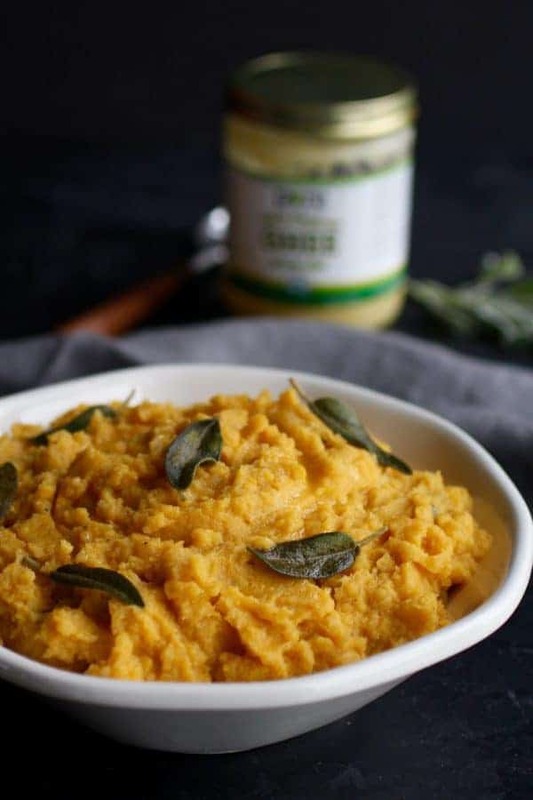 Anyhow, because this recipe is made with a mix of butternut squash, garlic, sage and ghee the texture is nice & creamy and the combination of ingredients is nothing short of being flavorful and nutritious! Butternut squash delivers a nice dose of dietary fiber and provides a significant source of potassium (bone health) and vitamin B6 (nervous and immune system) while cauliflower is rich in vitamin C and cancer fighting antioxidants. 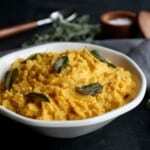 Cauliflower Butternut Squash Mash with Sage will make a perfect addition to your Holiday menu. Swap out the butternut squash for another winter squash like pumpkin or acorn. Like with many of our recipes, substitutions are always welcome! Feel free to substitute any winter squash of your choice. I’ve made this recipe with pumpkin as well and it turned out just as delicious. You may also substitute parsnips or potatoes for the cauliflower. Use what you have on hand! A note on cubing squash. Cubing squash can be a pain. A while back I shared a post/photo tutorial on exactly how to cube squash so you can check that out if you’d like. If you prefer avoiding peeling and cubing the squash altogether, you have one of two options. 1) You could purchase pre-cubed squash. Easy peasy. 2) You could pre-roast the squash by simply cutting it in half lengthwise, removing the seeds, placing it face down on a pan and baking it in an oven set at 375 degrees until squash is fork tender. Once fork tender, scoop out the squash and remove the peel. For this recipe the squash and cauliflower can be cooked however you prefer so long as they are both fork tender and ‘mashable’. Crispy sage…totally optional but highly recommended! Adding crispy sage to the top of the Cauliflower Butternut Squash Mash adds even more flavor. Simply fry the sage leaves in ghee for a few minutes and you’ll turn this simple side dish into something fancy and decadent for the Holidays! 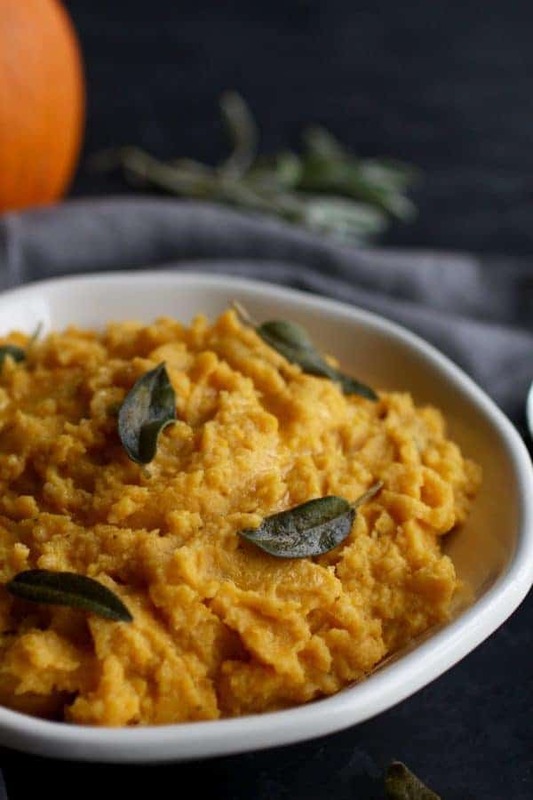 Cauliflower Butternut Squash Mash with Sage is a creamy, buttery side dish that’s full of flavor and packed with nutrients. The perfect addition to your Holiday menu and made with only 6 ingredients. Whole30, Paleo and Vegan-friendly. Bring a pot to boil. In a double steamer or steamer basket, add cauliflower, cubed squash and garlic. Cover with lid and steam until squash is fork tender. Time will depend on how big the squash cubes are. Note: You can cook the squash and cauliflower however you’d like, just as long as it is fork tender and ‘mashable’. Once the squash and cauliflower are fork tender, transfer to a food processor (or use a hand mixer). Add sage, ghee and sea salt. Process until smooth and creamy adding broth (or water) only as needed. For crispy sage: heat 1/2 tbsp. of ghee in a small pan over medium high heat. Once ghee is hot, add the sage leaves and cook for 1 to 2 minutes or until crispy on both sides. Remove from pan and place on a plate covered with a paper towel. To serve, transfer mash to a bowl and top with crispy sage leaves. You can also keep mash warm in a slow cooker set on low (or warm) until ready to serve. Looking for more healthy sides? We’ve got you covered. Check out all of our Side Dish Recipes here.